Jameson is appealing to the international jet setter with the release of a new special collection called City Editions, which will retail exclusively in Travel Retail outlets from this month for a limited period. The labels have been designed to capture the urban culture and essence of eight great cities around the world, featuring Amsterdam, Bangkok, Dublin, London, Moscow, Paris, Singapore and Sydney. To further appeal to collectors and highlight the travel theme, each label is finished with postage stamp edges. Each label will be exclusive to the corresponding city’s key international airport, with the Amsterdam edition being the first to hit the shelves in Schiphol airport from August 2013, retailing at €24.50*. 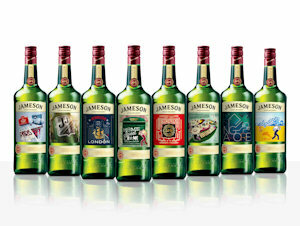 To support the launch of the City Editions range, Jameson has created an activation programme that aims to maximise visibility, consumer engagement and sales. Upon purchase, consumers will be invited to enter a City Editions Facebook photo competition for a chance to win a retro-inspired travel trunk, which doubles up as a drinks cabinet, containing all eight limited editions, along with four bottles of Jameson Original. To enter the competition, consumers will be asked to post a picture of their limited edition bottle or of the city they love on Facebook at www.jamesonwhiskey.com/cityedition. Entries can also be submitted in the airport via a smartphone or custom iPads in promotional spaces. The City Editions campaign will be further activated through experiential activities including a simulated bicycle ride in Amsterdam and a virtual city scape of Moscow.